St-Malo, built on a granite rock attached by a causeway to the north coast of Brittany in north-west France, is a beautiful walled harbour town with commanding views of some of France's most spectacular coastline. Known to many as a ferry port, St-Malo is a superb destination in its own right, and although its location makes it a perfect gateway for exploring the rest of France, the town itself has so much to offer that many people are happy to base their entire stay in the town. St-Malo, with its ferry port and infinite variety of things to see and do, makes a perfect weekend base for UK residents seeking a second home in France. The town offers superb shopping, with a selection of quaint and delightful little shops hidden away in the old parts of town as well as the much publicised hypermarkets and wine warehouses on the outskirts. The glorious Emerald coast lies before St-Malo, making trips to the seaside a matter of ease. The harbour, with its flotilla of little sailing boats, masts pointing up into the already 'bluer than British' sky, is a magnet for sailors, and walkers too find this part of Brittany about as close to heaven as can be found on earth. The Château of St-Malo is a favourite with visitors and sightseers, as is the beautiful cathedral and the Grand Aquarium. There is a wax museum too, and at low tide it is possible to walk out across the causeway to the tomb of the famous writer, Chateaubriand, at the Ile du Grand Bé. All around is the breathtaking scenery of the Emerald coast, and many visitors (and indeed, residents) find that they can idle away many an hour doing no more than simply gazing out to sea, or wandering the winding streets of the town drinking in the culture and atmosphere. In a place such as St-Malo, you would expect some seafood spectaculars to feature on the menus, and you will not be disappointed! St-Malo has some superb seafood restaurants, amongst which the 'A la Duchesse Anne', in the Guy-La-Chambre really stands out as exceptional. Splash out on the gourmet menu, which includes a glass of champagne alongside the five courses of regionally inspired seafood. For the simpler pleasure of pubs and bars, there is a great choice, with cellar bars providing unique ambience, and a whole range of traditional and not so traditional hostelries waiting to entertain you. There is even an Irish bar for those who prefer a pint of Guinness to a glass of wine! 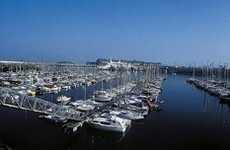 Exploring the wider area is another delight as so much of the lovely north-west of France is accessible from St-Malo. Travel inland to the pretty, historic town of Dinan, or take advantage of the myriad of sporting activities available in the region. Try your hand at watersports, horse-riding or cycling, or if you are a little more adventurous you could go paintballing, karting or even donkey-trekking! Reaching St-Malo is very simple. Ferries run from Portsmouth and Plymouth to the port of St-Malo, so travelling by boat without a car is a real option, unlike for many destinations in France. Air travel is another possibility, with the airport of Dinard close at hand, and direct flights offered regularly by cut price airline Ryanair and Aurigny. Property in and around St-Malo tends to be expensive, as the town is a major attraction for tourists and is so easily accessed from the UK. (It may be worth bearing in mind that although St-Malo has 50,000 permanent residents, there are as many as 200,000 in the summer!) There is, however, an excellent rental market for property, so if you are considering buying in St-Malo as a second home, you may wish to take advantage of the popularity of the area and rent your property to holidaymakers for the times you are not using it yourself. There are many types of property available, ranging from pretty stone houses with typical slate roofs, to impressive longeres and elegant townhouses within the city walls. Do you know St-Malo better than we do? Do you have photos of St-Malo? The town of St-Malo is situated in north-west France, on the Emerald coast of Brittany. It lies in the very north-west of the Ille-et-Vilaine department, looking out towards the channel island of Jersey. Access: By air: Fly into Brittany's Dinard airport with Ryanair or Aurigny. By boat: St-Malo has a ferry port with crossings from Portsmouth and Plymouth. Economy: The economy includes tourism, channel shopping, transport and fishing. 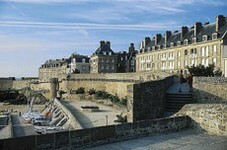 Interesting fact: St-Malo is the most visited place in Brittany.